The release date for this has moved back to 25 June. More details on the Gonzo Media website. I’m such a nerd I almost creamed over this! Can’t wait …..isn’t there a bit of when it blows it stacks in there as well ? I think I can live without this. I’ve got all the really good stuff including the Grow Fins boxed set which I do recommend. I can’t live without this. The old Booglarize clip has always been a favorite, so this is all just tooo coool for me. I’m no expert – but I’d never even heard much rumor of this full TV studio session, so a very unique surprise here. Got my copy this week (US)…. man, this is a fun weird DVD! The cameramen take a few minutes to get their act together, but it is ridiculously fun to watch! Don gets mad and walks off at one point. Marimba/Tripp miraculously wears a monocle while caveman drumming. Golden Birdies is profoundly odd to watch, and the instrumental “Steal Softly” is as close to seeing Trout Mask live as I will ever get. Salvador Dali would have enjoyed watching this. 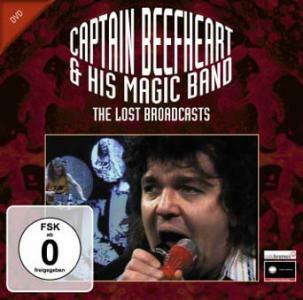 Cool misprint on DVD spine: Captain Beefheart & His Magic Bad. This is fantastic. Ed Marimba steals the show. A must have.